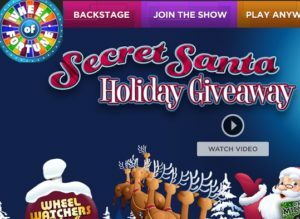 Enter the Wheel of Fortune Secret Santa Holiday Giveaway 2017 and you could win a dream vacation and more! Now is your chance to win Dream vacations, a new car and a sleigh-ful of cash could be yours! To ensure you can be part of this, simply Join the Wheel Watchers Club or log in by November 15th for your chance to win. Starting from December 4th–15th, Monday through Friday, our contestants are your Secret Santa, spinning to win for you. That’s right … if your SPIN ID appears on TV, you win whatever the contestant wins! The Wheel of Fortune Secret Sweepstakes is always a popular one! I can’t believe we are already about to wrap up 2017 and head into 2018, where does the time go? The one thing I love most about the end of the year, is all the amazing seasonal giveaways a sweepstakes! The season is just starting a boy am I exciting. Just the other day I won a $200 toy from a Toys R Us giveaway locally and I am pumped to see what else I can win before 2017 disappears into the rear view mirror. Win what the contestants win and win many other runner up cash prizes! Tis the season to get entering all the giveaways and sweepstakes you can find! Wishing everyone all the luck out there! Win what the contestants win and more!